It’s 2019, and Supplement Devil is back! So, to get the new year started in the right way, we’ve put together an in-depth review of one of the latest fat burner supplements to the market – Otech Labs RX-8. We recently provided an overview of the company and gave an insight into another one of their products – Trigger, which is their pre workout supplement. We found Trigger to be at the premium end of the market in terms of price. But, for that you most definitely get a premium product. The RX-8 fat burner supplement is certainly no exception, and we can’t wait to see what else this up and coming company has in store for what is set to be a huge year for the fitness industry. So, let’s not delay things any further, as it’s time for you to find out more about this particular supplement. Our full Otech Labs RX-8 review will cover everything that you need to know – from the price to which ingredients are included. Continue reading as Supplement Devil gives you the lowdown. In the final stages of 2018, we presented our guide to the best supplement companies to watch in 2019. Otech Labs just so happened to be one of them. So, getting our hands on RX-8 was something we were most looking forward to. Otech Labs is headed by current Mr. Olympia champ Shawn ‘Flexatron’ Rhoden, alongside his coach Chris Acet who is otherwise known as ‘The Technician’. Given the remarkable success of the duo in the last few years, we were expecting big things. Alongside the release of the RX-8 fat burner were five other supplements which formed the complete line-up. This includes BCAA AminoBlox, Elevate Testosterone Booster, Trigger Pre Workout, Volumax Pump Formula, as well as the lean mass formula Mass 500. Each of these products looked solid from the outset. After all, each of them contains a blend of decent ingredients which will help to take your fitness journey to a whole new level. When we browsed the Otech Labs website, we were very impressed indeed, given the amount of information provided and the clean, modern, and easy to navigate website design. The inclusion of a YouTube video with the product information was also a nice addition. It gave a nice overview of the supplement while providing guidance on how you should consume the product. This is great particularly for those who are new to fat burner supplements. What Will Otech Labs RX-8 Do? If you’re looking to kickstart your fat loss potential, RX-8 will certainly go a long way. Provided you stick with the optimal dosage, it’s possible to get great results. With a total of 30 servings per container, one serving equates to 3 capsules. You can consume this once a day first thing in the morning. Or, you could even opt for a second serving the same day. However, just make sure that you don’t exceed 6 capsules a day. As with most things in life, getting the balance right is all about trial and error. Simply start with one capsule a day, before working your way up to three or more. That way, you can test out your tolerance to the ingredients and find the dosage which works best for you. In the next section, we’ll delve deeper into exactly what’s included within Otech Labs RX-8. So, continue reading to find out everything that you need to know. It’s great to see that this extensively researched ingredient has been included within RX-8. After all, it has been proven to be hugely effective in more ways than one. For starters, it’ll help you to feel more energised both physically and mentally. This is great as fatigue is a problem which many people encounter while on a cut. So, this will help you to fight through your workouts and obtain great results. L Carnitine also has the ability to reduce overall muscle damage too. This means that you’ll recover more quickly from your workouts. Caffeine anhydrous is without a doubt one of the best ingredients to have within a fat burner. After all, it provides a boost of energy when you need it the most. At the same time, it helps to suppress your appetite which is the key to success if you’re looking to burn fat. However, at 350mg per serving, the dosage of caffeine within RX-8 is a little higher than we would have hoped. To avoid side effects such as energy crashes and jitters, around 200mg or less would be more optimal. Because of the relatively high dosage, it’s well worth experimenting with your intake to test your tolerance to this particular ingredient. Found in foods such as meat, fish, yeast, milk, eggs, green vegetables, and cereal grains, Niacin is a form of Vitamin B3. This is an essential vitamin to have in terms of overall health. However, there is currently insufficient evidence to suggest that Niacin has any effect on weight loss. Therefore, it would have been better to use a proven ingredient such as green tea extract. This particular ingredient works well within a fat burner for more reasons than one. Otherwise known as N-Phenethyl Dimethylamine, this particular ingredient is beneficial in terms of its performance enhancing properties. As well as this, you’ll find that it can be used as an appetite suppressant. It will also make you feel fuller throughout the day. When it comes to White Willow Bark, we’re not particularly fond of this ingredient. For starters, it is known to cause side effects such as stomach upset and digestive system upset. Although, this can vary depending on your tolerance to the ingredient. However, the main reason we’re not fond of White Willow Bark is because there is insufficient evidence to suggest it is effective for weight loss. It’s recommended to be cautious with this particular ingredient as it is known to be similar to ephedra – banned by the FDA in 2004 due to it causing serious side effects on the heart. Otherwise known as Bitter Orange, this compound could be replaced by a more effective one such as cayenne pepper – which is proven in the weight loss department. L Tyrosine is an ingredient which has been proven to be effective in terms of improving your mental performance, as well as enhancing your alertness. This is perfect throughout your workouts as it will allow you to remain focused and get those all-important gains! Yohimbine is an ingredient which hasn’t been proven to be effective for weight loss or boosting exercise performance. Therefore, it can be said that the inclusion of this ingredient wasn’t really necessary. A proven ingredient such as Glucomannan would have been the better choice here. Priced at $49.99 at the time of writing, you can pick up Otech Labs RX-8 directly from the official website. So, at least that way you’ll know that you’ll be receiving a genuine product. As we mentioned earlier in the review, you get a total of 30 servings per container. So, depending on how many servings you consume daily, it might be worthwhile buying more than one container per order. If this particular fat burner supplement is within your budget, it’s well worth a shot. However, if you’re limited on the $$$ it’s probably worth searching for a more cost-effective option. Well, that concludes our complete guide to Otech Labs RX-8 folks! We’ve already spoken of our admiration and excitement when it comes to Otech Labs. So, RX-8 was certainly a highly anticipated supplement on our part. 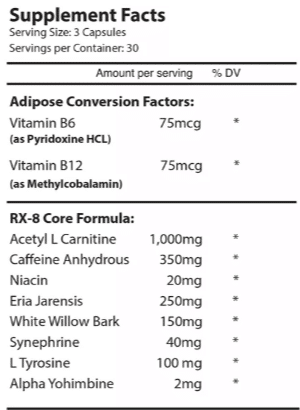 RX-8 contains a blend of solid ingredients including L-Carnitine and Caffeine Anhydrous. But, it could easily be improved by removing ingredients such as Yohimbine. This could be replaced by a more proven ingredient in the form of Green Tea Extract. In spite of this, we were pretty impressed with what RX-8 has to offer. Sure, it’s at the premium end of the market, but given the effective ingredients which are included, you can certainly get your money’s worth. That will be all from us at Supplement Devil. If you’d like to discover all of the latest news about Otech Labs and the rest of the supplements industry, you can do exactly that by keeping an eye out on our website. Alternatively, you can head straight over the official Otech Labs website to learn more about the company and its complete range of supplements.